Jonah Hill and James Franco in "True Story." Photo courtesy of Sundance Institute. “True Story” opens with the destruction of a teddy bear and the child that owns her. As viewers, we understand how this very simplistic visual cliché works – the bear is the child’s innocence and essence, and, when the bear is destroyed, so is the child. The problem, of course, is that this is not strictly true. In reality, the bear is just a bear, but we as an audience assign it symbolic value because, as a detail in a narrative, it seems to be of import. Throughout his debut film, director Rupert Goold frequently relies on such simplistic visual symbols. But, while these symbols appear to be the result of inexperience and laziness, they are actually rather strategic. Goold is interested in how we use visual and narrative clichés to construct stories around facts that appear inherently inexplicable. In turn, this interest allows “True Story” to evolve from a maudlin, ripped-from-the-headlines piece to a thoughtful reflection on the dangers of narrativizing reality. “True Story” is the reportedly accurate tale of Michael Finkel (Jonah Hill), a reporter for The New York Times, who is fired from his position after he is caught fabricating a major story. Blackballed by every major publication, Finkel is forced to return to his home-state of Montana and to his long-time girlfriend, Jill (Felicity Jones). Then, at his lowest point, the perfect piece falls into Finkel’s lap. Christian Longo, a serial killer wanted for the murder of his wife and family, was recently captured in Mexico while using the alias Mike Finkel. As quickly as possible, Finkel reaches out to Longo and an uneasy alliance is born – Longo agrees to tell his story exclusively to Finkel, in exchange for Finkel’s assistance in becoming a better writer. 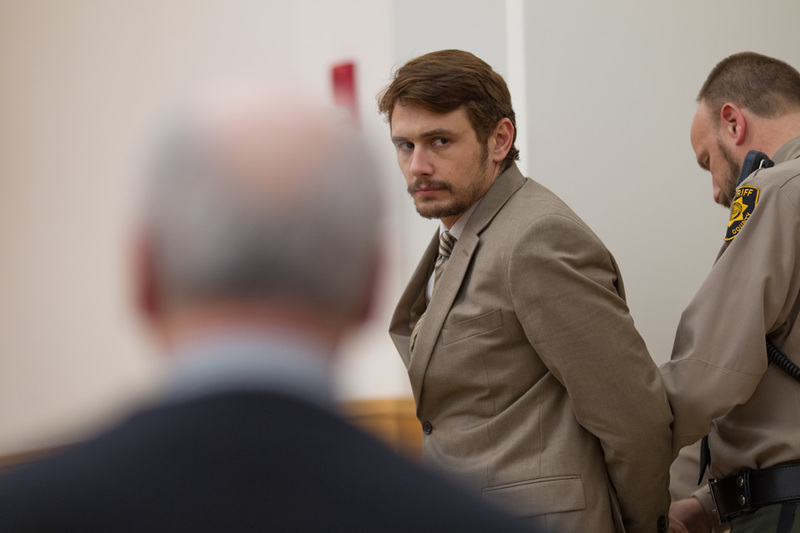 James Franco in “True Story.” Photo courtesy of Sundance Institute. Of course, “True Story” is not a true story; it is a film. Like Finkel, filmmakers often distort information so as to produce a better narrative. In this regard, Finkel’s early failure as a journalist — and Goold’s manipulations — become pivotal to the film’s message: that our desire to narrativize facts distorts our ability to objectively interpret information. In addition to strong writing and directing, much of the credit for the success of the film must go to the cast, particularly James Franco. Most actors would use the role of a serial killer as an excuse to overact, to externalize the insanity of the character, whereas Franco underacts. His Longo never pitches his voice or shows any signs of emotion. He acts like a man who is coping with a terrible tragedy — not a psychotic murderer — thus transforming Longo from a one-note character into an interesting enigma. The sadly under-utilized Felicity Jones also merits praise for her turn as Jill. For most of the film, Jones seems like an oft-ignored addendum to Hill’s character, a prop used to indicate how Finkel’s obsession with Longo is affecting his home life. Yet, in one standout scene, Jones demonstrates more intuition, strength and resolve than any other character in the film. Of course, “True Story” isn’t perfect. For what is supposed to be a reflective, somber meditation on the nature of truth, the editing is far too rapid. One particularly egregious scene, a less than one-minute conversation, contains, for no discernible reason, over five cuts (my notes: “This isn’t a music video damnit!”). Also, rather fatally for a film that consists mostly of conversations, Goold is not able to find an interesting or engaging way to shoot dialogue. Most scenes rely on the standard shot reverse-shot method. Yet, even this classic technique is not as effective as it should be because Goold does not understand how to use framing. He is frequently content to shoot entire conversations in close-up. But, if everything is in close-up, the shot becomes meaningless. Regardless, Goold’s film is quite good. Despite the faulty editing and framing, the most irritating aspect of the film — that it portrays the murder of an entire family through simplistic visual clichés — eventually becomes one of the film’s greatest strengths. This film is not about the destruction of a family; it is about how we try to make sense of this destruction, and, in doing so, how we toy with the facts to create a better narrative. Contact Raymond Maspons at raymondm ‘at’ stanford.edu. Raymond Maspons is a class of 2017 Film & Media Studies major. He was raised in Miami, but born in Los Angeles. One of his particular interests is the unique and subversive thematic or formal qualities that often appear in genre films. Since elementary school he has spent a significantly large amount of his life watching movies and television, and not doing trivial things like homework.